I have been working with metal since 2003. Talisman and amulets were once carried for protection through the difficult world. I forge a connection to the past ways through my work. I capture the definition and defying of time, speaking to that inside of us, unchanging and persistent. I specialize in mixed metal jewelry and accessories, using steel, silver, brass, bronze, and copper. Through forging, fusing, soldering, and riveting, I create ancient yet contemporary designs. While metal is one of the worlds toughest materials, I find it empowering and humbling to form and shape it to a new life, breathing expression of forgotten cultures. I contribute funds monthly towards planting trees in the Amazonian rain forest, in order to off-set my carbon footprint and assist in healing our environment. I incorporate the textures of bones, seeds, stones, feathers, and quills into my metalwork, creating life and story. I also include industrial elements such as clock gears, bullets, keys, and machine parts that juxtapose natures sacred beauty and suggest a mysterious curiosity within the human spirit. 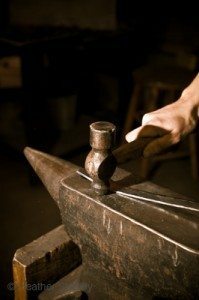 My passion is to offer adornment and meaning, to channel the flows of my experience into form, and to pursue and preserve the ancient, artistic techniques of blacksmithing. I create to reveal the quaint ruins of past and ethnic cultures to form objects of protection, beauty, emotion, and narrative. I am the third born of a Northern family, immigrated to the mountains of Western North Carolina over 40 years ago. I was born and raised in the mountains, on a small horse farm surrounded by hundreds of acres of forest. My childhood was filled with a lot of responsibility and fun, with an endless natural world to discover, whether through horses, the wilderness, or my own soul. The years following my high school graduation were filled with adventure of many sorts; some formal studies in anthropology and dance, traveling to Africa many times, Europe, and Central America, as well as within the United States. 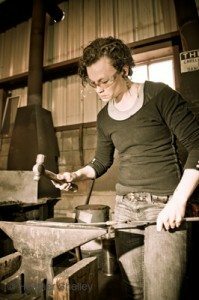 Upon returning to Asheville, I began studying medicinal plants and soon after jewelry, which then brought me to an interest in larger steel production work. Now, I specialize in handcrafted jewelry and ironwork, forging modern design with ancient technique. I am committed to a strong ideal of customer satisfaction and enhancement to ones life, as well as to meet structural and functional ironwork needs, in the most elegant and artistic ways. I find passion in working with metal and offering adornment and practicality. My chosen medium has brought me inspiration to maintain and preserve ancient techniques, to save the art of blacksmithing and share my passions with others. If you would like to see more pictures of my work, please check out my face book page, JLMerrill Metalworks.